Our minds are marvelous, intricate things, created by God for our use and for his glory. What are we feeding into our minds? Because whatever we feed, will grow. 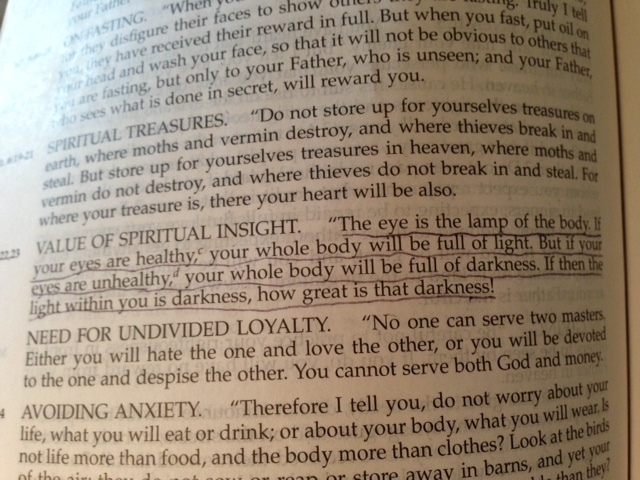 God tells us in Matthew 6 that our eyes are a lamp to our bodies. If our eyes are healthy, our whole body will be healthy. But, if our eyes are unhealthy, our whole body will be full of darkness. Have you thought about what you’re feeding into your mind? It’s hard to avoid the darkness that presses in from our culture all around us. For some reason, God has developed in me a heightened sensitivity to the darkness around me and a clear awareness of the work that Satan and his team is doing. As a result, I avoid most shows on TV, most movies and a lot of books. Any music other than Christian music usually has some lyrics that turns off the light and brings on the darkness. We can be careful about what we feed our minds with when its our choice but we obviously can’t avoid it all as we live our lives in this world, but not of it. God calls us to turn on the light and push back the darkness in our world as much as we can. In order to do that, we need to be filled with his truth. Filled with his love. Filled with his light. Please fill us with your light, dear Father.